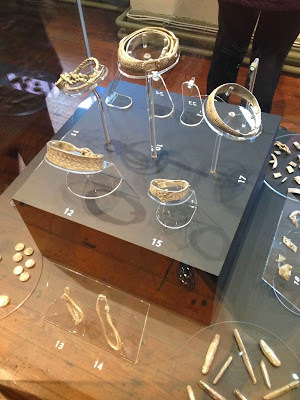 This weekend, I went to have a look at the Silverdale Hoard at the Lancaster City Museum. It is a collection of Viking silver that was found in Silverdale by a metal detectorist (how exciting must that have been to find?!). It is apparently the third largest hoard of Viking silver found in the UK and includes a variety of coins, arm rings and metal bars. 1,000 years ago a Viking must have decided to bury the silver for safe-keeping and for whatever reason wasn’t able to come back and collect it – probably an unhappy ending for them. The silver was all quite beautiful and I felt strangely connected to it – the person who made it clearly used techniques that we still use now. The thing I did notice though was how thick the silver was on some of the arm bands, they must have been heavy to wear - I suspect thought that they were probably made for men (most of them would have slipped right off my arm). 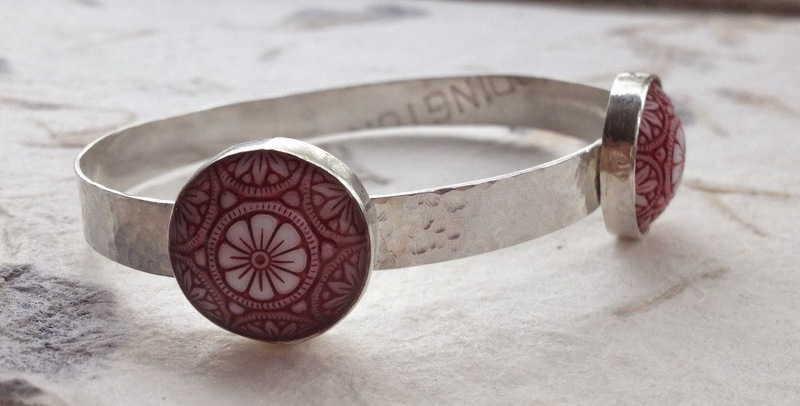 I bought these pretty glass cabochons and have made them into a silver bangle. They were so pretty that I didn’t want to lose any of the pattern so I set the stones with resin rather than rubbing the bezel walls down to capture the stone as I would normally. You’ll probably see some writing on the inside of the bangle. The silver is from a cup that my Grandad won for gardening. He was an amazing gardener – anything in his care would grow tall and strong, bursting readily into flower and fruit. Actually he was a man of many talents – he was an incredible swimmer and an excellent upholsterer - not that many people would know these things about him because he was also a man of few words. Anyway, back to the gardening. He won the cup at his local gardening club so often that they eventually just gave it to him outright. 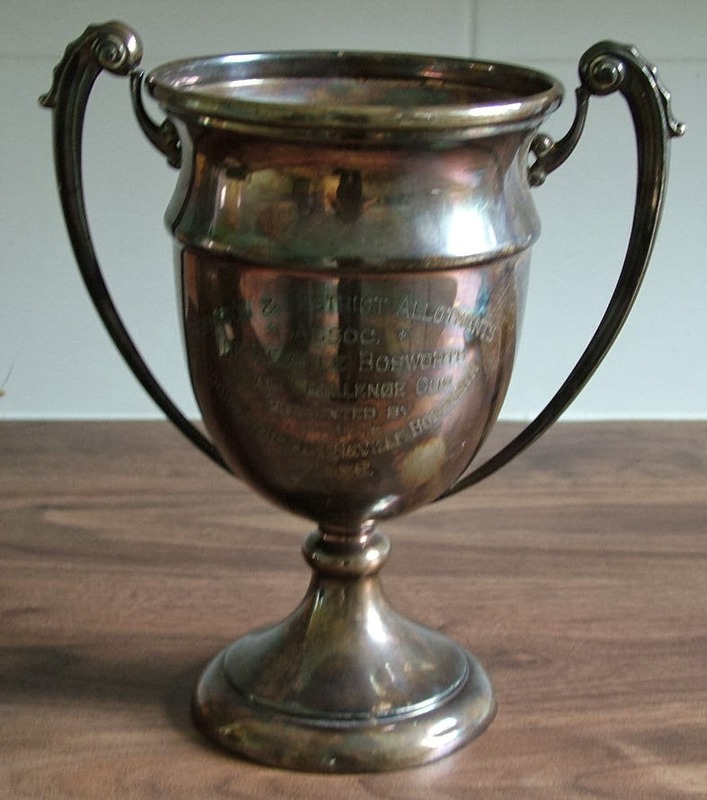 The cup sat at the back of a cupboard for many years (as you can tell by the tarnish on it - see below). I’d heard about the cup but never seen it until my mum rang to say that she thought Grandad would want me to use the silver. I did have mixed feelings about breaking up his cup - though I do like the idea that Grandad is still supporting me, as he always did. 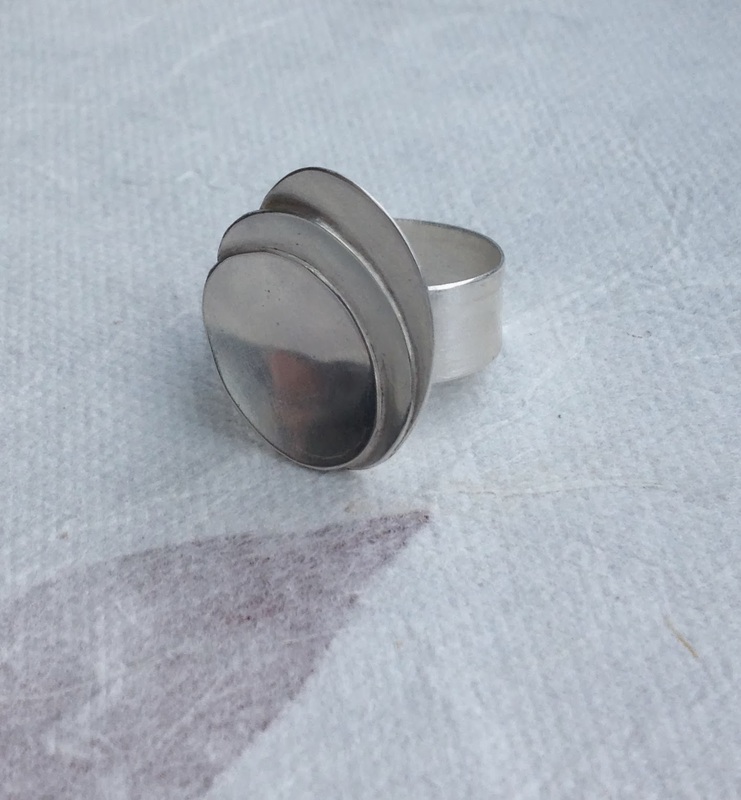 I’ve been using the silver from the cup for a while now - everything made in silver that you’ll see on this blog from October 2012 has been made from Grandad’s Silver – and there is still some left. It has been a real gift, allowing me to try many things that I might not have done had I been worried about paying for the silver! I particularly like using the parts of the cup with writing on, as in this bangle – it reminds me of where the silver has come from. The parts of the cup with Grandad’s name on are particularly precious and are reserved for special pieces.